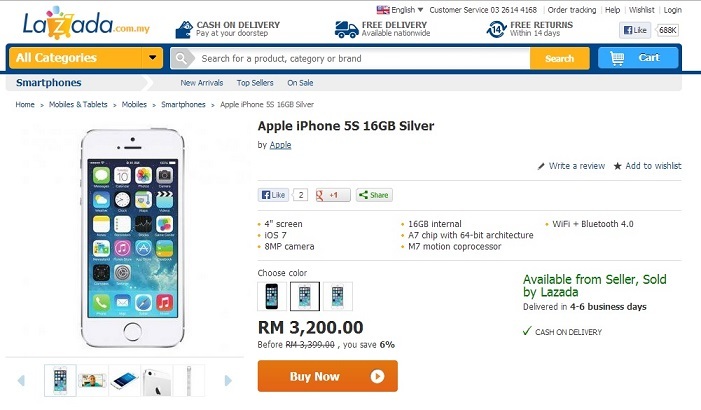 Shortly after Groupon Malaysia released its iPhone 5c deal, retailing Apple’s latest smartphone for what appears to be an inflated price tag of RM2199, local online e-tailer Lazada Malaysia took things to a whole new level with its prices for the iPhone 5s. 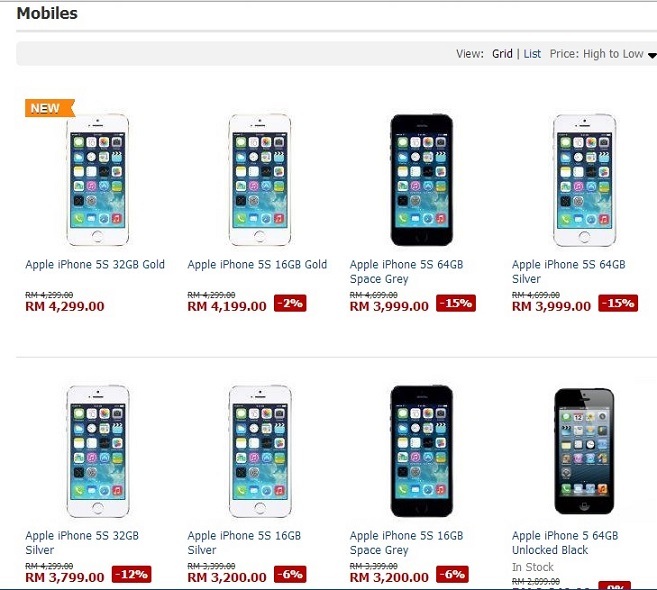 A quick check on Lazada’s “Mobiles” section for Apple will reveal that the iPhone 5c is priced the same RM2199 as what Groupon is offering its deal for, but the iPhone 5s – which retails for only $100 more than the 5c in the US – is going for a sensational RM3200. If you thought that is extremely unreasonable (to put that mildly), wait till you see how much the gold variant of the 5s – reported to be in very high demand worldwide due to its limited initial production – is retailing for on the site: RM4199. What’s more, the 64GB variant of the gold 5s is going for a kingly RM4699 – though it is “temporarily out of stock” at the time of writing. As most will know, official iPhone retail prices do not differ for different colours of the same model. Even worse is when you consider that there is no explicit mention of a one-year standard warranty in any part of the product page, nor is there any form of “localised” warranty provided (compared to what Groupon is offering). 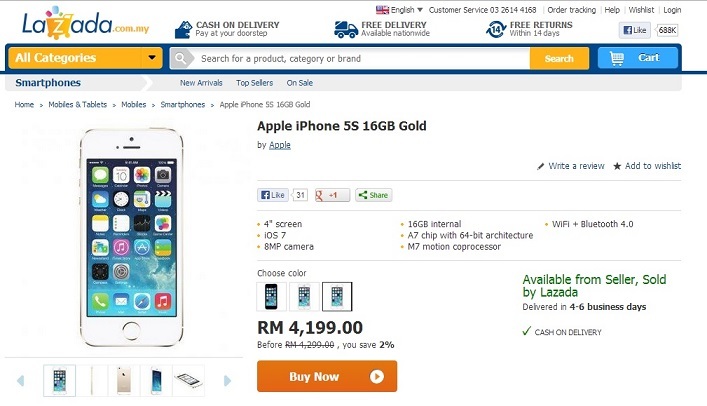 But perhaps the most insulting part of the prices listed on Lazada’s website is where some of these iPhone 5s prices – specifically, all variants except the 32GB and 64GB Gold – are being offered “on discount” ranging from 2% to 15%, when the official retail prices for Malaysia are not even known just yet. With no word yet on the official local availability for the iPhone 5s and 5c, I suspect this will not be the last we see of what is becoming an increasingly unhealthy phenomenon.